We have developed and manufactured a portable desalination machine. Our MYZ Series™ can purify sea water as well as contaminated water. It can even purify water that contains metal, chemicals or bacteria. Our modest size is great for emergency readiness and even suitable for most types of boats. It’s a helpful accommodation on construction sites near a river. Our desalination machine has passed Japan’s Ministry of Health and Welfare for safe drinking water. 1, The amount of purified water will differ according to the amount of salinity, the temperature and the quality of the original water. 2, Periodical cleaning and maintenance is required. One external sediment filter come with the unit. Two external sediment filter come with the unit. ※The size measurement does not included the size of the hose. ■Sediment filters for rough objects. 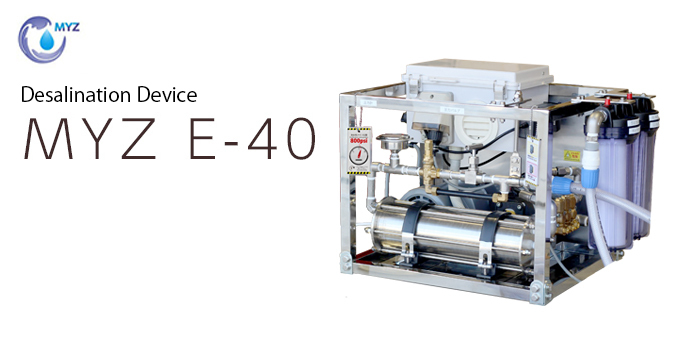 E-40 requires one sediment filter to be used. The other models require two sediment filters. The filter replacement frequency depends on the quality of original water. Replacement frequency varies depending on the quality of raw water. The reverse osmosis membrane is the core part of the desalinator. Although it depends on the original water condition, it is not necessary to change the reverse osmosis membrane for several years under the normal use. We are fully responsible for replacing the originally developed housing by our company. Gasoline or Diesel operated models and higher performance models that can produce more purified water are also available. Feel free to contact us.